Regularly eating fermented food is a great way of consuming probiotics, prebiotics and nutrients which all influence the health of our digestive system. While these foods aren’t typically considered appealing; eating them is gaining popularity due to their amazing health benefits. 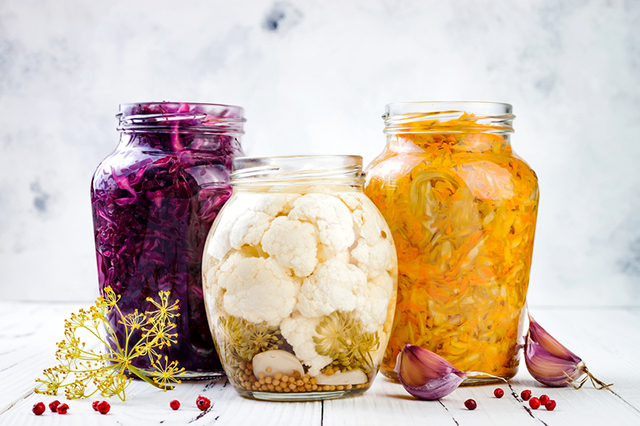 Fermented foods are simply plant-based food that have had bacteria, or yeast added, or that are left in an environment which enables bacteria to grow and ferment naturally. The good bacteria then break down starches, and sugars. This not only improves digestion but assists with the absorption of nutrients within food, that you would otherwise have difficulty accessing, unfermented. Where did fermented foods come from? Fermented foods were among the first ‘processed’ food products consumed by humans. A preserving technique, fermenting food ensured that produce harvested in the summer and autumn months, would last throughout winter when less vegetables were available. 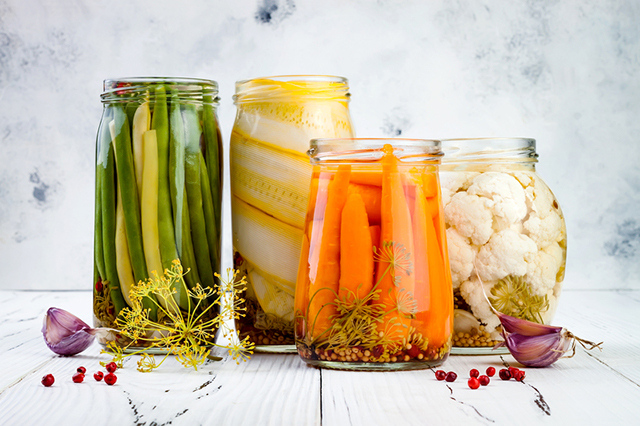 However since refrigeration has developed, the current interest in fermented foods is less about preservation and more about the associated health benefits. Fermentation helps our body to digest food, as it is already broken down. This increases the nutrient-density of our foods, as fermentation removes nutrient-inhibiting toxins such as phytic acid. The bacteria that live within fermented foods create a protective lining which helps to shield the digestive system against harmful pathogens, increasing the strength of the immune system. Fermented food also helps to restore health to the beneficial bacteria in your gut, and over time it can help to reduce sugar cravings as bad bacteria that feed on refined sugars, grains and carbohydrates are starved. You may know that more than 90 percent of the neurotransmitter serotonin is made in the gut, however the health of our gut doesn’t only support serotonin production. Fermented food assists the production of a range of neurotransmitters and neuromodulators that can alter our mood, reduce anxiety and boost brain activity. Fermented food is a wonderful addition to every diet. However, if you are wanting to introduce fermented food for the first time, it is important that you start small and build up your tolerance from there. Not only are fermented foods often strong to taste; sauerkraut for example contains histamine which may increase allergy reactions in sensitive individuals. The probiotics contained in fermented foods can however reduce allergies in the long term; another reason that fermented food can help you to achieve good health. Read more about The Top 5 Fermented Foods you should be eating.